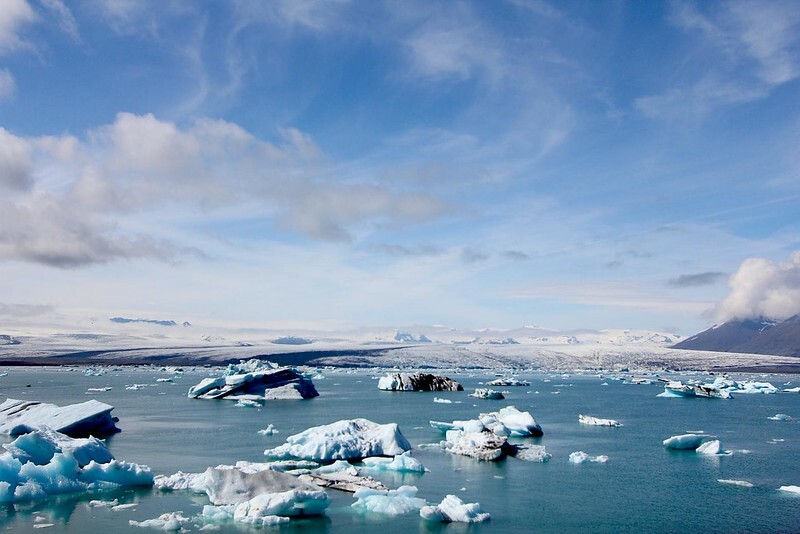 Jökulsárlón – the glacier lake. I don’t know why, but I’m fighting an urge to giggle at the photo above. I didn’t really look at it before I uploaded it to flickr and the fact that we’re smiling off into the distance and posing like that… I don’t know, maybe it’s just me and the fact that we’ve been in Reykjavik airport for several hours already and have a couple to go and I’ve only just stopped feeling awful from last night’s efforts to not waste out duty free allowance. 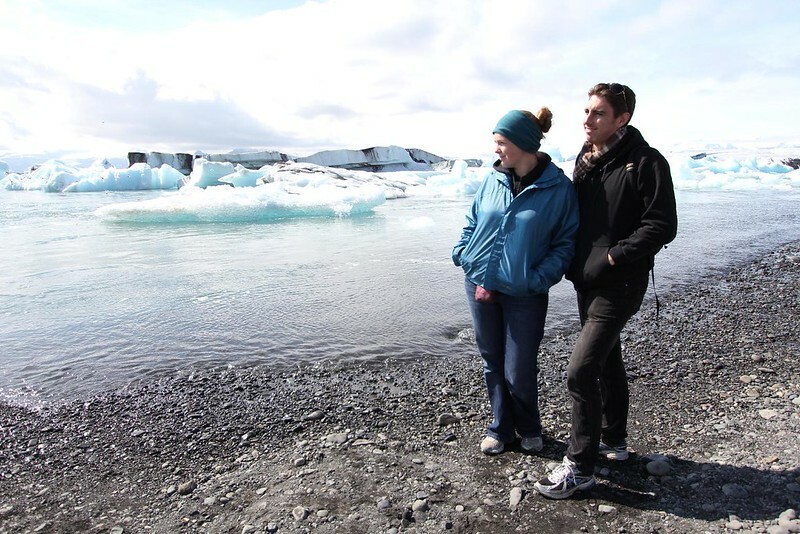 Luke and I went to see the icebergs twice at the biggest glacial lake. It was far, far more interesting than I thought it would be. 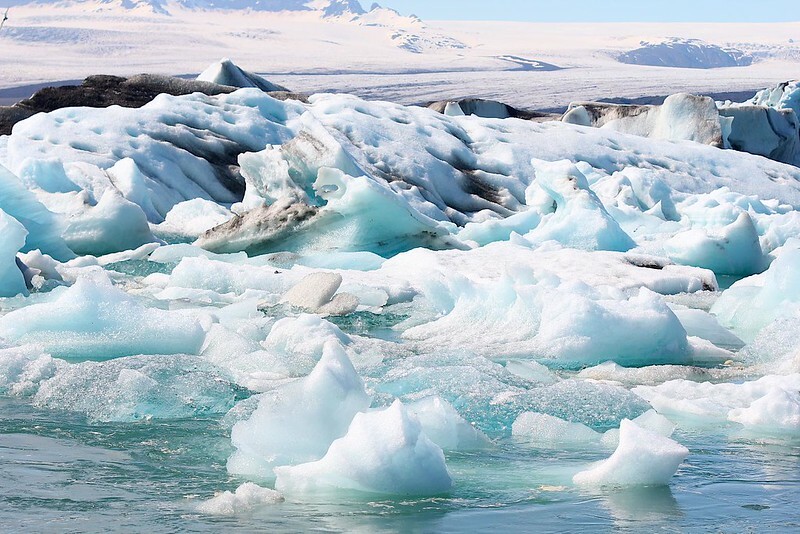 The lake empties into the ocean and the tide also flows back into the lake, so there’s lots of movement to push the icebergs around and they crash into each other quite loudly. 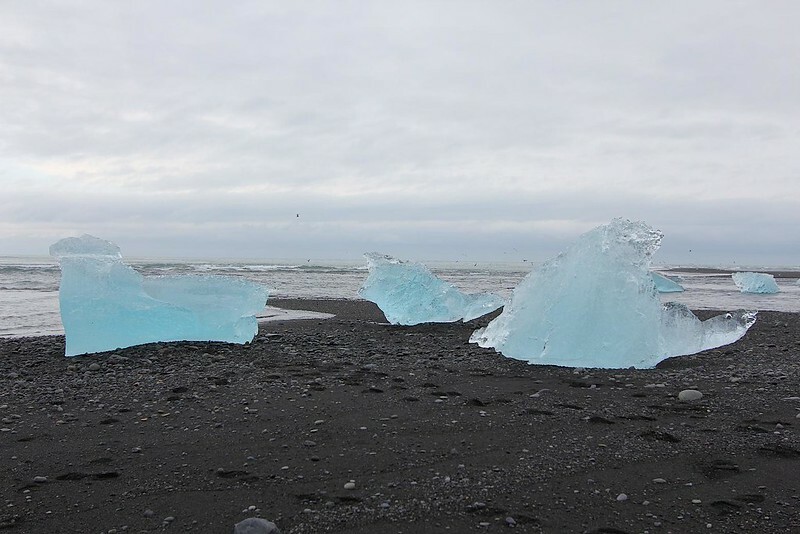 You can also hear the ice constantly cracking and melting and the splashing of the icebergs as they turn over. You could sit on the edge and watch them for ages, it reminded me of watching fish in an aquarium. The colours and textures in the ice were interesting too. Some were jet black and full of volcanic ash and rock. Others were clear as glass, some were white and others light blue. They were all different shapes and sizes. We saw one that looked like the Starship Enterprise. 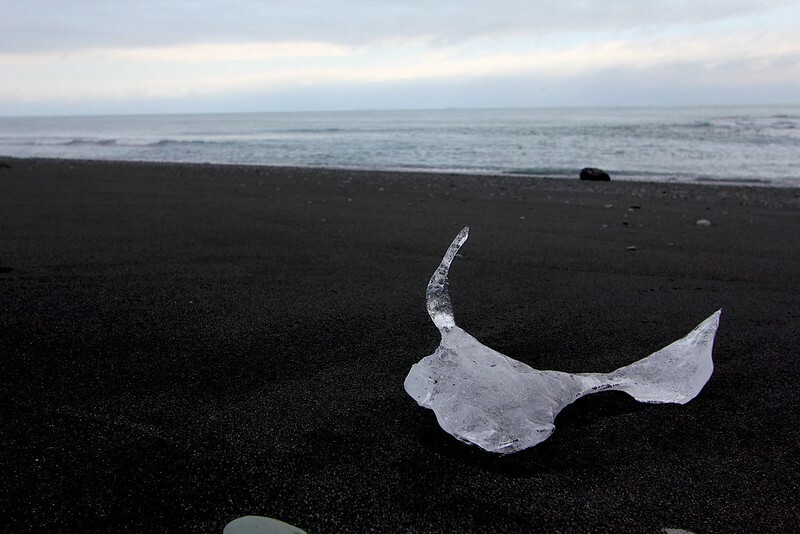 After our second visit we walked across the road to the black sand beach, where icebergs sat in contrast on the sand. Sometimes it seems like nature cannot possibly be single-handedly composing all these perfect scenes by chance. Looked like a cow skull to me. These pictures probably give the impression that we were the only ones there, but by this lake was the largest number of people I’d seen anywhere outside Reykjavik. There were tour buses and several companies taking people out in zodiacs and those big amphibious truck/boat things. Still, it did not really seem crowded and parking spaces were easy to find. There was only one cafe on the site, selling the usual tiny range of filled rolls, one kind of soup and cakes and muffins. It’s hard to tell whether the businesses have some kind of official monopoly on places like this or that Icelanders aren’t very tourist-savvy, because if there’d been a guy with a hot dog stand or someone selling hot chips they’d have made a killing. The differences in the way tourists are catered to in different countries we’ve been to is fascinating and it’s hard to say if anyone’s doing it completely right but Iceland certainly errs on the side of under doing things. That being said, if not being able to buy interesting food is the price I pay for no billboards, no hawkers, no rubbish and peace and quiet then I don’t mind… for a few weeks. After we left the ‘official’ glacier lake the second time we were driving back west and saw some cars parked off the road near a glacier tongue. We turned off and discovered another lake of icebergs, this time with almost no one around and no movement in the lake at all, as it was not joined to a river. That’s where we took the new header photo at the top of the page. Not really knowing a whole lot about what there is to do here, and not getting much direction from the company we booked the car and hotels through, we weren’t sure what we’d find to do each day. But the way to see Iceland is to just drive and then stop whenever you see the sight-seeing symbol or a space to pull off the road – no matter where you are there’s something amazing to see and hardly anyone else around. Sometimes you almost feel like you’ve got the country to yourself. It has certainly been the only place in the world where we’ve felt like the only Australians. In fact nearly everyone, on hearing our accent, commented on the fact. “You’ve come a long way!” was the frequent response. Indeed we have… and only a few weeks from now we’ll be in Africa. Onwards and southwards!